I was making zero progress on losing five pounds or eliminating grains and dairy to see if that helped with the joint pain. My snacking was completely out of control. As in I would eat breakfast and then grab a cookie for dessert. I was eating junk food all day long. Pathetic. I had to make a decision: give up or do the Whole30 again, sigh. Bowling is starting and that really hurts my hands. And I decided I was too young to just go ahead and let the weight creep up. So Whole30 it was. Then I dithered about the start date. And then my husband announced they were doing the Whole30 again at work starting right after Labor Day. Wait, that would overlap my 50th birthday and there was no way I wasn’t eating cake on the big day! Looking at the calendar I realized I needed to start right away to be done before starting my next year of life. With no real planning or grocery shopping I jumped in. Having done the Whole30 before I knew what to expect. I needed to survive the first seven to ten days. I didn’t worry about how many yams or sweet potatoes I ate. And I didn’t sweat the snacking. As long as I only ate compliant foods I was going to consider the first week a success. I would deal with snacking the second week. I also made a vow to be very kind to myself. My biggest side effect the first week was fatigue. I slept more and several afternoons found me on the couch watching a movie. I kept my to do lists short. I didn’t even attempt to tackle anything I knew would be frustrating. A new bottle of nailpolish. Revlon’s ‘Dreamer’, a pretty sky blue, completely new shade for me. 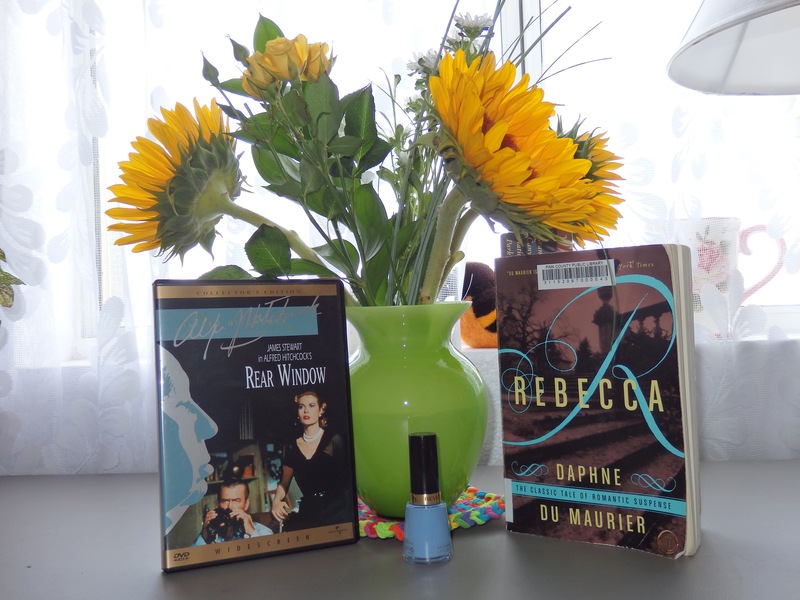 Rereading the book “Rebecca”. Scariest non-scary book ever! Mrs. Danvers gives me the heebie jeebies. I feel bad for my fellow introvert, the second Mrs. De Winter who I have decided is named Jane. What do you think her first name is? Watching my favorite summer movie: “Rear Window”. Jimmy Stewart, Grace Kelly, Thelma Ritter and Alfred Hitchcock, the best combo ever! Plus I like to be reminded that other places get hot in the summer too, and poor Jimmy not only doesn’t have a pool or a/c but a cast on his leg. Talk about summer misery! So I survived the first fifteen days. Of course it is easy to be cavalier about it with it now in the rear view mirror. I am keeping my eye on the goal now, not so much the weight but eliminating snacking and seeing how my hands feel after bowling this week. I am pretty sure the joint pain is caused by a lack of estrogen from going into menopause so I don’t know if diet can help in anyway but either way it will be good to know. Snacking hasn’t been too bad. The first week I twice ate a mid-morning banana before running errands that I knew would end close to lunchtime. Most days I ate an after school snack with my son: celery w/cashew butter, an Rx Bar, a few olives. I munched a few celery sticks while preparing dinner if I am starving. Nothing too horrendous. But the last few days I haven’t snacked at all. Yeah! And now I am halfway done. I am already thinking about the reintroduction phase which I have failed so miserably in the past. I am hoping the fact that my birthday is Day 31 won’t completely derail my reintroduction. After my birthday eating Whole30 between reintroduction days won’t be that big a deal as my husband wants to stay Whole30 until his doctor’s appointment the first week of October anyway. Hopefully what will be a big deal is how good I feel!